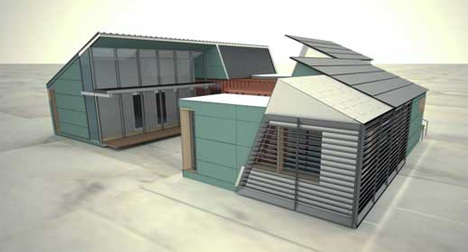 In the 2007 Solar Decathlon, students from the University of Colorado had a beautiful entry to show off: this beautiful energy-efficient home built around existing shipping containers. The group’s goal was to shift conventional thinking about both construction and energy consumption. By making the home more efficient, they eliminated the need to heat and cool it at the perimeter, instead relying on an HVAC system only at the core of the house. Because of its energy efficiency and its use of recycled building materials, this design seems like a viable environmentally-friendly home for the future.